Lurid tales of torture, murder and dismemberment are emerging from Turkish officials about the fate of missing Washington Post writer Jamal Khashoggi, a prominent Saudi critic of Crown Prince Mohammed bin Salman (MbS). 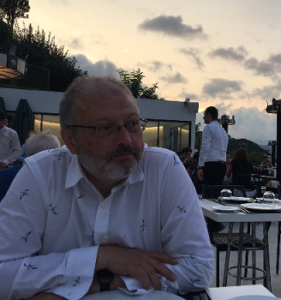 He disappeared, last seen entering the Saudi consulate in Istanbul on Tuesday. Analysts say it is inconceivable that such a claim would have been made without firm grounds. 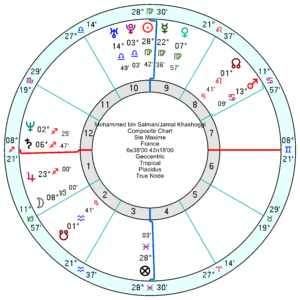 Born 13 October 1958 in Medina, Khashoggi has a Libra Sun under pressure from the tr Pluto square this year. More pointedly he has a Mars in Gemini square Pluto which has moved by Solar Arc to collide with his Neptune which is a nasty mix and would be expected to accompany very unpleasant experiences. 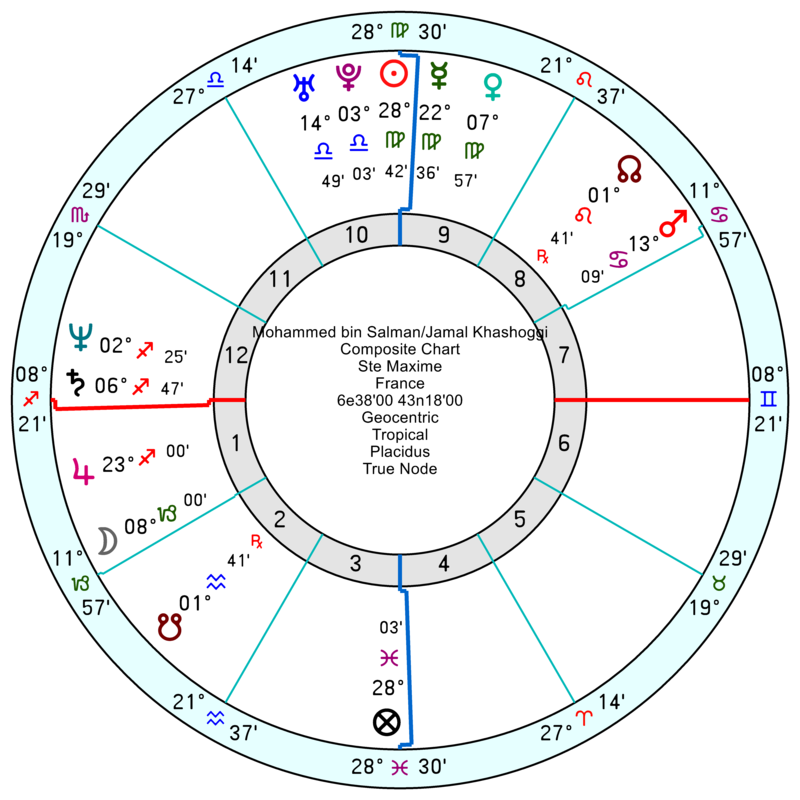 His relationship chart with MBS has a power-struggling composite Sun Pluto with tr Saturn exactly square the Pluto at the moment. And that Pluto is opposition Mars, so it is a bitterly hostile relationship. MBS who was initially seen as a hope for constructive reform in Saudi Arabia has damaged that reputation with the humanitarian crisis in Yemen caused by his reckless military action; and his suppression of dissidents and activists. MBS’s bro-romance with Trump and more so Jared Kushner look to be hitting a wobbly patch. 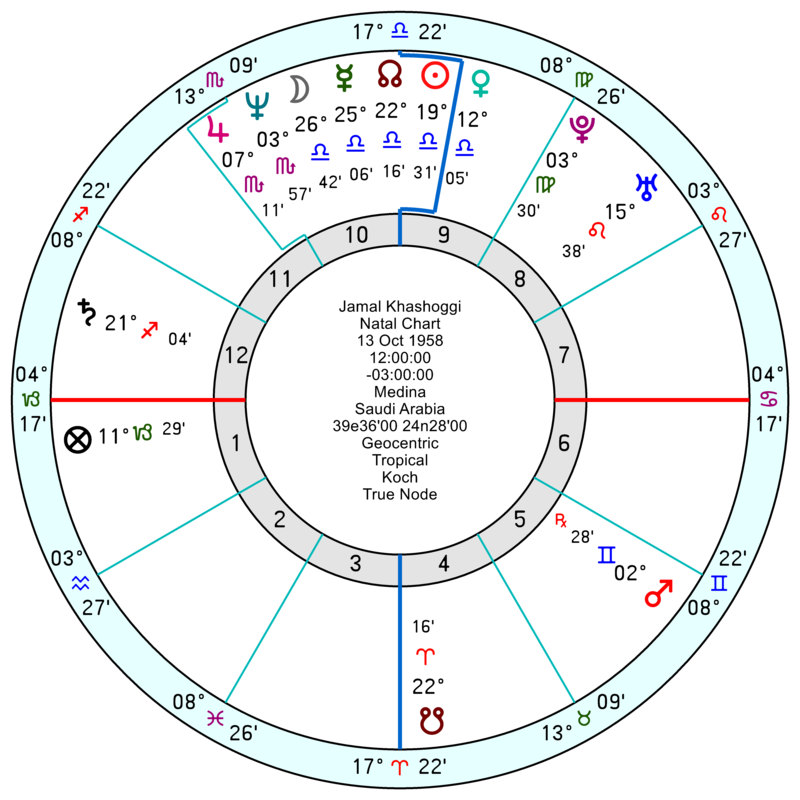 With Trump from as early as mid this month with tr Uranus square the composite Sun and then Venus, with a Neptunian disappointment towards the New Year and running into early 2019. 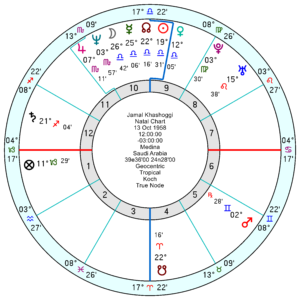 With Kushner, the bumps are occurring at the moment and more so in December/January 2019 and beyond with tr Uranus opposition the composite Saturn and square the composite Pluto. MBS’s own chart is moving through a bumpy phase with a nervy, highly-strung tr Neptune square his Uranus until late this December; and into early 2019 he’s picking up the tr Uranus opposition his Pluto and squaring his Venus – which looks like upheavals, disruptions and emotional shocks. But his Pluto does square Jupiter natally so he’s lucky and not short of bullish self-confidence. Poor man and his fiancee, it is just terrible. Note proximity of Sun and Moon to north node: He was born on a solar eclipse.